In putting together this Precor AMT100i review we collated feedback from customers around the country. It’s an incredibly popular piece of fitness equipment that has loyal fans from coast to coast. 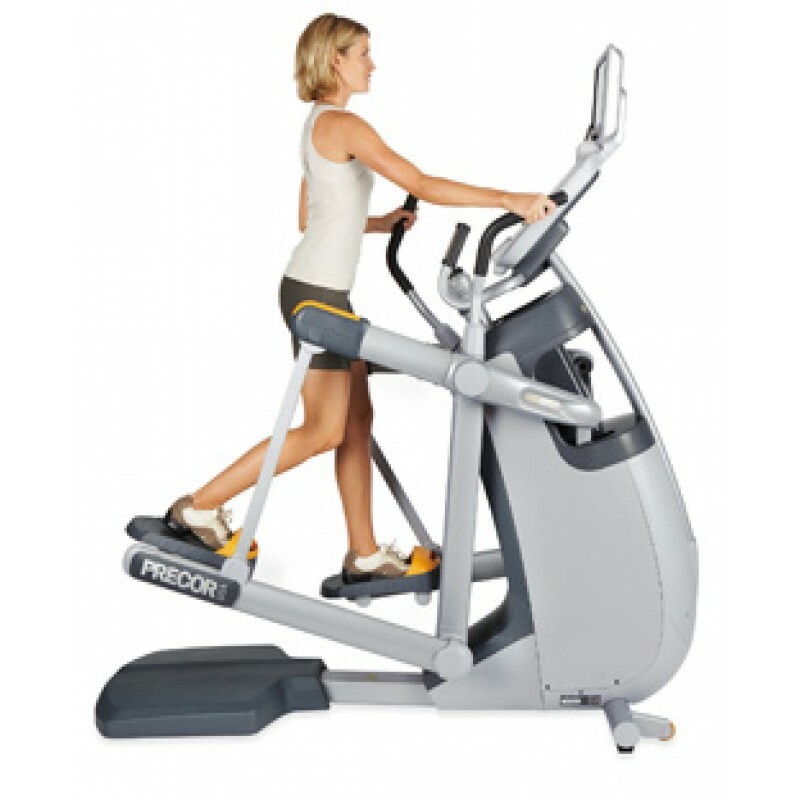 This is mainly due to its calorie torching capabilities and variable stride motions, but the fact that it’s manufactured by a reputable company like Precor adds to its prestige. People know that they’re getting a quality piece of equipment that’ll last for the long-term. So, what do customers appreciate about the Adaptive Motion Trainer (AMT for short) and who is it suitable for? In this Precor AMT100i review, we break down the details, so you can decide if it’s right for you. Most people are immediately impressed by the AMT’s calorie torching abilities. In terms of energy output, it’s up there with the treadmill, but the funny thing is that it doesn’t feel as hard. Customers often comment that they notice a big difference in caloric output, yet there’s less impact on the joints. Many will say that they’ve used every other cardio unit under the sun, but the AMT is by far the most demanding machine that they’ve ever tried. If you’re looking to lose weight but don’t fancy pounding away on a treadmill, the AMT is a highly effective option. This is one of the reasons that it’s so popular with personal trainers since they know it’ll deliver weight loss results for their clients. One of the biggest draws of the AMT is the feature it’s named after: adaptive motion. 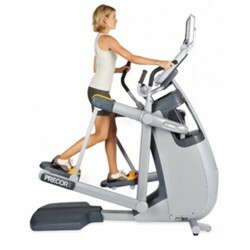 It allows exercisers to perform a range of different stride types, from long-stride (similar to running in sand) to short stride (more like a traditional elliptical). It’s even possible to perform a climbing motion so that you get the benefit of three cardio machines in one! Many people comment that they like to change the motion on the fly and break up the rhythm. It’s impossible to get bored when you’re able to change up your movements without even pressing a button. This also makes it suitable for a wide range of user heights, with the stride length automatically adapting to accommodate taller and shorter exercisers. Families, in particular, get real value from the AMT since it can be used by everyone, no matter their size. This wouldn’t be a comprehensive Precor AMT100i review if we didn’t mention the fact that it delivers a total body workout. Not only can you vary the stride lengths, but it also features both static hand grips and moving arms. Many people comment that they want to work out their upper and lower body at the same time, which isn’t possible on bikes or treadmills. This also challenges the core muscles, delivering a solid all-around workout. Something that many users appreciate is the high intensity coupled with minimal impact movements. For people with knee, back, or neck injuries, running on a treadmill can cause a jarring sensation that aggravates the issue even more. But the AMT provides a smooth, flowing motion that places a minimal amount of impact on the joints. This makes it ideal for people with injuries and those wanting to rehab back to full fitness. Instead of being confined to stationary bikes, you can still benefit from a high-octane workout while staying within safe limits. The AMT can help you to burn a serious amount of calories, which makes it perfect for people with a goal to lose weight. The variable stride motions mean that it’s practically impossible to get bored, even if you usually hate working out. Plus, it can comfortably accommodate users of all different heights and sizes. If you’re short on time, then choosing a piece of equipment that provides a total body workout can be an efficient option. For those with joint injuries, it may also allow you to exercise harder than stationary or recumbent bikes do. This Precor AMT100i review is intended to highlight the most frequent feedback we hear about the Adaptive Motion Trainer. If you’d like to learn more about the product, then check out its key features here. Alternatively, get in touch with one of our team and we’ll be happy to answer any questions you may have.